We are soooo close to it being only single digit days until the 2018 edition of DesignerCon, that we can almost taste that sweet Anaheim air! With only 11 days to go (ELEVEN), the news for DCon will be coming thick & fast over the next week before we fly to LA next Wednesday. Back at the height of Summer, we brought you news that there will be a new Kidrobot Multi-artist Dunny Series at DesignerCon this year and we can start now to bring you the actual images of said Dunny! It starts off with the DCon mascot, Vincent. Designed by Mr Scott Tolleson. 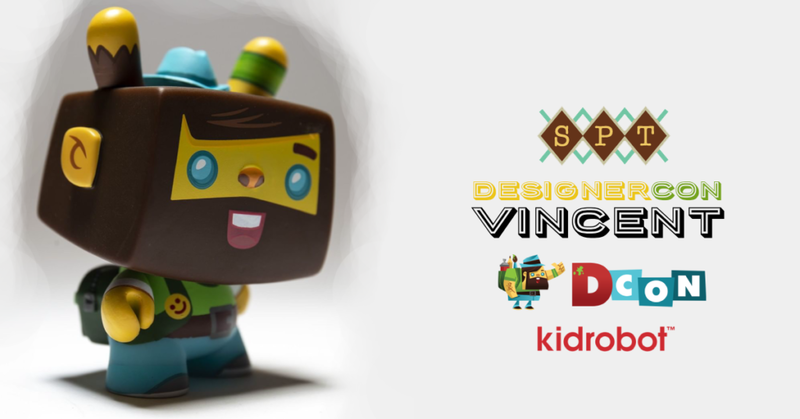 Celebrating the rich history of DesignerCon, this new Dunny series features artists and designs by @craola, @deph, @jonpaulkaiser, @hyperactivemonkey, @kanokid, @flatbonnie, @chetzar, Paul Frank, Christopher Lee and @ragnarsquad. Kidrobot are slowly releasing information & images for this wonderful new series. We also have the Jewel Guardian by Christopher Lee and Black Magick design by Chet Zar (which you can see further down this post). Get the DCon Dunny series at the Kidrobot booth #2010 at DesignerCon NEXT WEEK or online on Friday, November 16th at 10am MST (5pm BST) on kidrobot.com! If you’re yet to buy your DesignerCon tickets, ohhhhh boy why ever you leaving it so late? Head on over to the DCon Ticket store HERE and snag your ticket! Don’t forget to come check out TTC at the Xpanded Universe booth #933 for beard hugs & shizzle! Information snagged from the Kidrobot Instagram HERE.